London, UK, September 2018: Holidays may be about kicking back and relaxing, but for those looking for an outdoor adventure, look no further than the Caribbean island of St. Kitts. Adorned with beautiful beaches, sparkling oceans and lush rainforests, there are endless ways to keep active while soaking up the sunshine. From competitive events, such as the annual cross channel swim from St. Kitts’ sister island, Nevis, to challenging outdoor leisure activities such as hiking a volcano, there is something for everyone to enjoy. St. Kitts may be a small island but it packs a huge adventure. Standing 1,166 metres (3,792 feet) high, Mount Liamuiga is a hike – and a challenge – like no other. The dormant volcano is surrounded by rainforest and provides incredible views across the island. Diving is a great way to keep active while having fun at the same time. 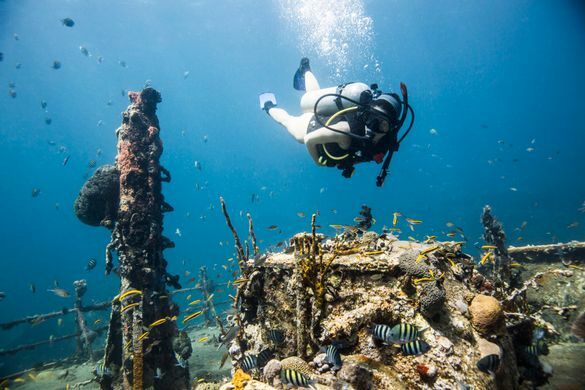 Scuba divers of all ages and abilities delight in St. Kitts’ glorious oceans, with many sites virtually unexplored. Bordered by the Caribbean and the Atlantic, the island offers a range of options, from near-shore reefs to subaquatic caves. Underwater visibility ranges from 30 to 100 feet deep, meaning you’ll have crystal-clear views of walls, ledges, under hangs, coral towers, and sunken ships, all swarming with sea life. Dive centres include Bird Rock Beach, Kenneth’s Dive Center, Pro Divers, and Scuba Safaris Ltd. For further information visit www.stkittstourism.kn/activities/diving. The annual Nevis to St. Kitts Cross Channel Swim has become one of the must-do open water events in the Caribbean. Taking place in March each year, hundreds of locals and visitors take on the 4km swim from Oualie Beach on Nevis across the “Narrows” to Cockleshell Beach on St. Kitts. The event will be in its 18th year in 2019, taking place on Sunday 31 March, and swimmers can even purchase customised St. Kitts and Nevis swimwear to show their support. To register, visit www.nevistostkittscrosschannelswim.com. Many visitors choose to take on the scenic triathlon on St. Kitts’ sister island, Nevis. Participants swim the Caribbean waters, cycle a course around the entire island of Nevis – taking in the stunning views – and run to a finale on the beach. The triathlon takes place on 10 November 2018. For further information or to sign up visit www.booknevis.com/what-to-do/nevis-events/nevis-triathlon. Other options for more casual runners or walkers include the Royal St. Kitts Golf Course scenic path, Timothy Hill scenic walk, or a journey from Frigate Bay to the southern-most peninsular of the island. For those looking for a more relaxed way to enjoy the island, rest assured there are plenty of other leisurely activities to enjoy in St. Kitts, including sunbathing on the beach, stand-up paddle boarding, the St. Kitts scenic railway, and visits to Carib Petroglyphs, Brimstone Hill Fortress, and sugar plantations.